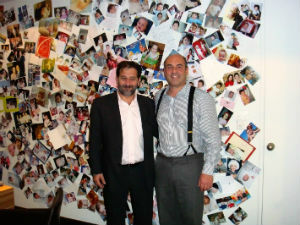 Obstetrician and Fertility Specialist Dr Thanos Paraschos has helped more than 10,000 babies get born. Since 1996, he has been running EmBIO Medical Center, (Athens, Greece) and performing all types of labors at IASO Maternity Clinic. As a Registrar at the Southmead Hospital (Bristol), the third largest obstetric clinic in England, he was responsible for all operative deliveries (Simpson’s, Wrigley’s and Kielland’s forceps, ventouse vacuum extraction and Caesarean sections). Among his responsibilities was training of new obstetricians and midwives. With Miss G. Turner, he performed complicated pregnancies (diabetes, phaeochromocytoma, prolactinoma, haemoglobinopathies, lupus and rhesus alloimmunisation, renal disease). At the time, Dr Paraschos was running the diabetic antenatal clinic along with the medical team, attending perinatal morbidity and perinatal mortality meetings. At the Southmead Hospital, Dr Paraschos gained sound experience in the management of normal and abnormal labor. The unit performs 6250 deliveries per year. As a Senior House Officer at the Southmead, he performed numerous ventouse extractions, traction and rotational forceps deliveries. He also conducted vaginal breech and twin deliveries. Both elective and emergency Caesarean sections were performed for a variety of clinical indications. As a Registrar at the Hammersmith University Hospital (London), he gained significant experience in the management of high risk pregnancies. The Hammersmith is the par excellence hospital for high risk pregnancies in London. The hospital accepts up to 200 in utero transfer cases per year from all over London and surrounding districts. For two years (1993-1995) Dr Thanos Paraschos was dealing with cases of severe preeclampsia, intrauterine growth restriction, premature labor, premature rupture of membranes and multiple pregnancy (twins, triplets), labor for women over 45, pregnant women with diabetes etc. As a Senior House Officer at the Norfolk and Norwich University Hospital (NNUH), Dr Thanos Paraschos gained a significant expertise in the management of obstetric problems and complications during pregnancy. The delivery rate at NNUH, one of the largest hospitals in the UK, is 5500 per year. Performing a wide range of obstetric risk procedures, he gained valuable experience. Dr Paraschos acquired his ultrasound skills at the King’s College Hospital under Professor Kypros Nikolaides, the inventor of the nuchal translucency test (nuchal scan). Working with Mr P Smith at the Bristol Maternity Hospital (Southmead), he gained experience in detailed ultrasonography and Doppler studies, and enhanced his expertise in obstetric ultrasound procedures, performing ultrasound amniocentesis and chorionic villus sampling (CVS). Working at the SCBU of Southmead Hospital Dr Paraschos was involved in all aspects of neonatal care. Southmead hospital provides care for the 6,250 infants born in hospital. Αt the specialist neonatal intensive care unit (NICU) he gained precious expertise in neonatal care procedures such as: lumbar puncture, umbilical line insertion and peripheral line insertion, infant resuscitation, endotracheal intubation and endotracheal ventilation. He was first on call for operative deliveries or when there was any evidence of fetal distress. Contact Obsetrician Thanls Paraschos today!